Without doubt, we have now had more than our fair share of April showers. Unfortunately – and unlike the Chaucer scenario – March was by no means a drought in that we had not only a large amount of rain and but snow as well. In fact it feels as if there has only been one day of sunshine in about three months. November fog rather than April showers.. we could hardly find the Castle! John G (one in from the right) announced he had walked 370,000 muddy steps (138 miles) during this Easter public opening – he really was keeping track of everything! 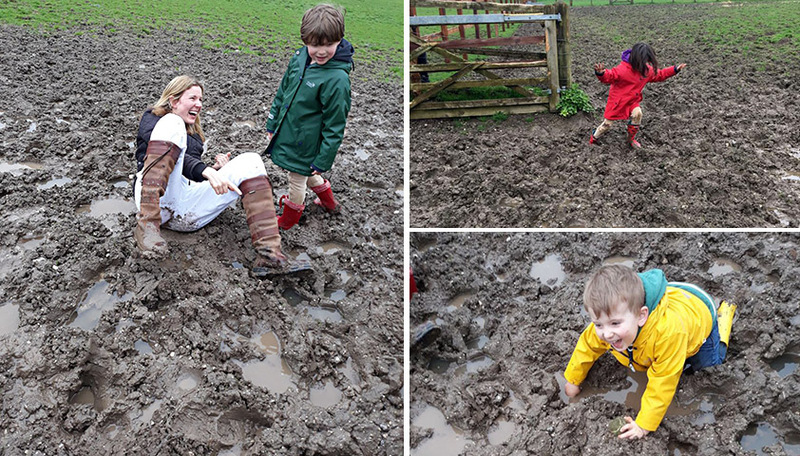 As the forecast became more and more dire, we had to email our visitors to warn about the mud and explore what would suit them in terms of arranging their visit. Some visitors came and braved the awful conditions, whilst others opted for hopefully drier conditions in the summer and transferred their tickets to the later opening time. Paul, our head gardener, became the ADC for car parking strategy. We rented all the local track mats we could find and his gardening team, Ben and Matthew, acquired expertise at putting the mats together. 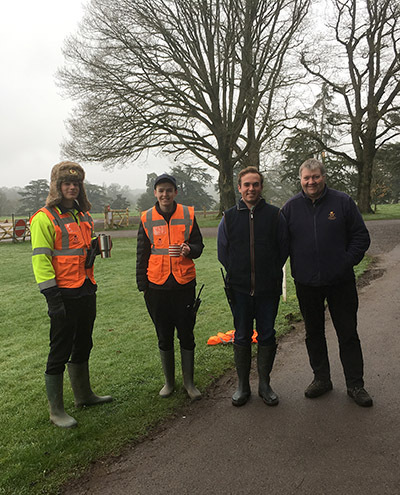 Dorian from the farm and Sam from our Highclere team drove visitors round in circles, collecting and returning them to their cars which were scattered all over the estate. Alex, George H, Dave B and others parked cars far and wide, on verges, around our cricket pitch and by the chapel. I specialised in moving track mats, looping four of them behind my little grey car in the evening and heading off to the next new parking area. Paul Mac, in waterproofs and bobble hat, conducted cars left and right from the middle of the Park – and welcomed the hot tea and Cornish pasties I dropped off returning on my rounds with visitors. Some of my passengers asked me if I worked here, to which I replied that I did and when they kindly asked what I did, I said I was not really sure – a mixed bag and swiftly asked then where they came from. Some visitors asked if I lived nearby – “not far,” I replied. Another set had asked my husband if he had worked here long “ yes – too long” came the reply. As the week came towards the end, one of my sisters came down with her children wearing white. London has obviously been having very different weather! I was in Scotland the past two weeks….it was dismal but I was glad to be with my friends…perhaps I should have read some Chaucer as well….I look forward to your blog posts every week! Thank you for sharing your adventures, history and love for all things Highclere….greetings from across The Pond! It seems mother nature is angry at us all. Here in Nebraska we must endure blizzards and severe weather for a little while longer. Let us hope Winnie is correct. Oh my.. what a soggy battle. I feel for you all in the struggle. Here in Missouri it is approaching planting season.. but yesterday as I backed out of the garage it took a minute to process the fact of Snow falling on my windshield. Ugh.. here’s to sunny weather soon for both our homes!! God bless and stay dry if possible. Ahhh… mud season. I have lived those seasons in Montana and Maine. It can be a truly impressive time of year. Who knew how mucky and sucky a field can get? Or unpaved roads? Or road berms? lol… I hope no one lost their wellies to the mud. Hate having a boot sucked off while walking across a muddy no-mans-land… then trying to get my sock-clad foot back into the boot before losing my balance and plopping a usually light-colored sock right into the muck. I also had a loud laugh at the white pants in the brown, wet mud… well, I guess if you’re willing to put yourself in the middle of a mud patch then clothing will probably be the sacrifice, especially with kiddos frolicking in that same mud patch. I’m sure the clean-up from that fun was epic!! Happy Spring to all and I hope the sun starts peeking out in your neck of the woods soon! Cheers from Summerville, South Carolina! Hats off to your staff for working so hard to keep things moving! grow. Wishing you sunny days soon! I never mind being interrupted – we were working shifts! the tempreture just reached 40f. Goodness me – that is tough. Jumping in puddles is pretty good! How is it that you make a cold, wet, muddy situation sound like an adventure not to missed? I truly enjoy hearing your stories of life at the castle. Here’s hoping your April showers bring May flowers. In Minnesota, some of us are digging out of a 16″ (average) 3-day snowfall. 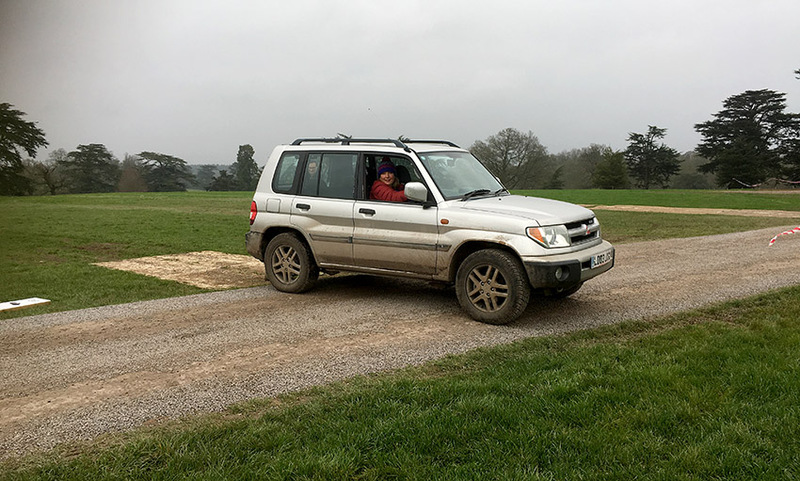 Like the folks at Highclere and those who also responded in this blog, Mother Nature has definitely forced us to come up with alternate plans and “workarounds”, all the while building memories! Mother nature can make us seem no more in control than Chaucer’s “wee dronken mouse” in the Knight’s Tale. So glad we were able to come and visit on a sunny Easter a few years ago. This has been a winter/spring to remember. Thanks so much and hoping for better weather. Thank you – can’t beat Winnie a Pooh..
April showers bring May flowers…and sometimes there was snow on Easter Sunday in Chicago, oh yes. I feel for the wet and muddy days you had to endure and help the visitors to the Castle. And after living the first 25 years of my life in the cold and grey and snowy “Spring” of the Midwest, I feel for my fellow-Americans. Sending you all wishes for warm and sunny days soon, as I sat at the foothill of the Acropolis yesterday in 30oC sun…blowing some of this Greek blue sky and sunshine your way . Keep living the dream! 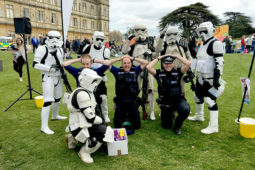 So nice of you to spotlight just one of the many teams it takes to keep Highclere operating no matter the time of day or year! You have such a knack of selecting words to describe a scenario of everyday living at your home that are not only informative but humourous too! Obviously you and Lord Carnarvon are dearly loved as it shows in the deep dedication and longevity you have in your loyal and able staff on all levels indoors and out! Thank you again for another well written blog. We too are soggy here in Connecticut, USA. I feel so bad for you with all that rain. I live on the plains of New Mexico (the State, not the country) and we haven’t had rain or snow here all winter. But I do remember what it was like as my husband and I were stationed in Wales a long while back and it seemed to rain every day. My girls were little and could not wait to go tramping around in their new ‘wellies’. I was not so predisposed. I will be visiting England (and your lovely home) next year so I hope for ‘dryer’ weather. I found that some of your ‘visitors’ did not recognize you and your husband to be very amusing, perhaps name tags would be in order? Maybe they were expecting “Carson” or “Lady Mary” to appear as so many of us love “Downton Abby”. Anyway I enjoy your blog so much, glad I subscribed and am anxiously looking forward to my English winter/spring next year. I do mind which role I play – above all it is the practical one. Your post reminds me of our visit in May, two years ago with a group from Iowa Public Televsion. We were lucky in that we were the only visitors that morning ( with the exception of a school group for the Egypt exhibit) so our bus got to pull up right to the front door. We did get wet on the way to the gift shop and I lost my umbrella temporarily as one of our leaders borrowed it to ferry people to the bus from the shop. However, I would gladly have braved the rain and mud to have had either you or your husband as a driver. If this helps at all, here in central Iowa, we would be happy if it would just stop snowing. We had four inches yesterday morning, and northern Iowa had ten to fourteen inches with more forecast later in the week. (Ugh)Best wishes and hope you dry out soon. I hope you move past the snow season soon! Here in Florida, we are no strangers to rain. It rains almost every day but clears up pretty soon and the sun shows his smiling face again. Since this is the city of West Palm Beach, there is neither mud nor slush nor fog. However what you pen so eloquently sounds very romantic and ethereal and yet very realistic and practical. Thanks Lady Carnavon for sharing your vivid descriptions which retains the charm of Highclare castle. Aghhhh, so much rain. Enjoying sunny weather and a glorious 70 degrees f. here in Texas.You will have to come visit again soon! My sister-in-law Barbara will be visiting from Scotland come May and no doubt she will find it hot! Best wishes and good luck with the muddy pastures! WISHING YOU SUNNY DAYS SOON !! Years back, I was at a house I used to own in upstate NY, and I went to the Renaissance Fair there…it was pure mud pies everywhere…and I got stuck in the parking lot. Some nice guys and gals said they would push me out, but when the car got out…to gas it and keep going..not to stop for any reason. So, that I did…and I had to look back in the rearview mirror and see everyone that helped me, covered head to toe in mud from my spinning tires….it still makes me chuckle, 20 years later and I so wish I could go back and thank them! Well, it seems weather topsy turvy this spring. Here in Malta it’s still occasionally overcast and we have had our fair share of rain. Still forecasting possible showers all week. My olive trees are enjoying it and many are now in flower. Started 2 weeks early this year. Hope weather improves for you and you have a successful season. Here in the States, in New Hampshire…we have a Fifth Season called Mud Season. There are no celebrations during Mud Season. No special food or special songs. Nothing. We just want it to go away! My daughter and myself enjoyed a lovely but rainy day at Highclere Castle on April 9, and were made most welcome by everyone, after parking our car we were driven to and from the house through the lovely grounds by friendly drivers and we walked to the greenhouses and walled garden then had our lunch in the marquee, it was all delicious. Thank you for a lovely day. With some embarrassment, I feel that we in Sydney may have ‘stolen’ all the good weather. It is mid April (mid-autumn here), yet yesterday our beaches were full and I was able to swim in my backyard pool after sunset. My family will try to take some decent weather with us across to your shores when we visit next month, provided that you promise not to send your rain and mud back with us! Promise you bring your sun! It is now getting better and everyone smiles! Mother Nature certainly is fickle right now! I visited Scotland and England in March. I was quite surprised to see snow on the ground in Scotland and experience some rain showers. In Houston, Texas, we are seeing a 30 degree temperature change today! At the moment, it is currently 70 degrees and sunny. I hope our sunshine heads your way! 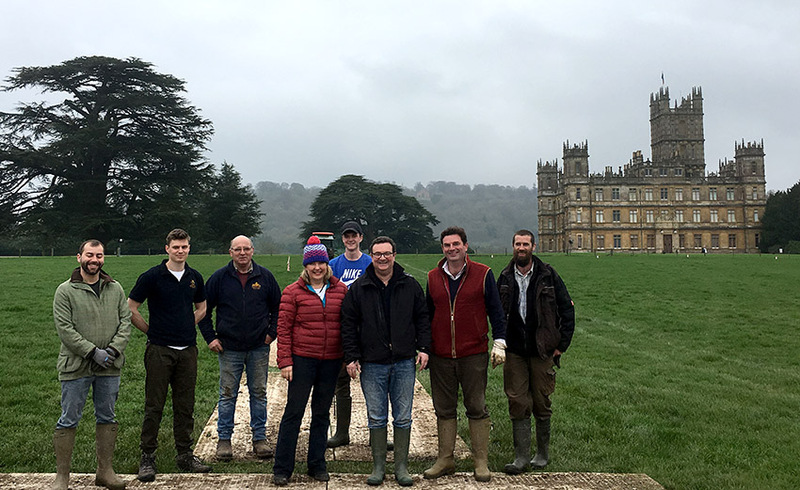 Kudos to you and your staff for carrying on while “living the dream” at Highclere! Our weather, here in Oklahoma, has been a challenge as well…one day winter, 28 degrees, the next day in the 70’s. Of course this makes us appreciate the good days even more. I got quite a chuckle out of people not recognizing you and your husband. I’m sure that makes your Staff truly appreciate you both…you aren’t afraid of getting into the task at hand. I hope someday to visit Highclere and when that day comes, I will be on the lookout for you. I hope you will come and visit ! That quote certainly didn’t apply to the hearty folk at Highclere. And it appears that your youngest sister and her children got into mischief without any ‘assistance’ from a cat-in-the-hat. I love the photo of the little ones playing in the mud: your sister looks as though she is having the most fun. Mother nature does as she pleases: here in California we would welcome the rain to break the drought and ease the water shortage. We have the sunshine which you need and which would help to ease the parking dilemma for you and lift spirits: although you all look like you are coping very well. I guess Mother nature is no respecter of persons and so we take what she gives and try work with what we have. Hoping that you will see the sun soon!! I love reading your lovely literate posts–you are such a gifted author, (and now peppering your post with great English literature to boot, no pun intended)! 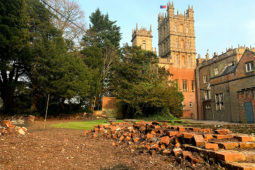 It looks as if Highclere Castle could more aptly be named the Carnarvon Ark at this point. I love rain, and we have gotten our fair share in Saint Louis this season, but fortunately no flooding of our mighty Mississippi. We’ve sojourned in England five times now, and each time, we Americans (according to our friends) seem to bring warm weather and sunshine. In fact, in the summer of 2013, when I packed layers of sweaters and long-sleeved cotton tops, we encountered your worse heat wave in three-hundred years! Let me just say that it was not the most pleasant thing to be sweltering when we thought we were going to walk through the land with “seasons of mist” (albeit Keats was describing autumn). But, of course, we will take England any way we can. Some day I’d love to visit and stay permanently. I smiled when you and your husband said that yes, you worked! I love how you personally roll up your sleeves, don your Wellies, and do whatever needs doing, come rain or shine . . . and endless rain! Thank you especially for considering your writing and chronicling your days at Highclere as one more job that needs doing. You do it so well! You are kind and most welcome to return with your sun!!! Rainy days and mud were never so entertaining as when you write about them. We are in the middle of the same sort of day here in Upstate NY with the possibility of snow tonight…enough already, let it be spring! My mother and I are headed to England, Wales and Scotland the first 2 weeks of May so here’s hoping the rain lets up by then! 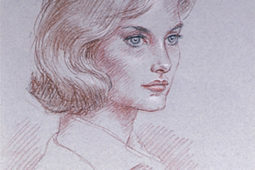 As always we love to follow your wonderful stories of Highclere. Thank you so much for your postings – I always LOVE to read them and especially loved this one! As in previous comments above, I particularly enjoyed yours and your husband’s responses to your guests questions as to whether you worked there and where you live!!! Can you imagine if they only knew??? Although you are tired of the weather there, here in Orlando, FL it has been nothing but hot and sunny! We are hoping to be able to visit your beautiful home this summer as we bring our daughter over for the first time (her daddy was born in Bournemouth) and we keep telling her the weather there is quite different than what she is used to! In reading your post to her, we are having to define “wellies” and “oil skins” and “Cornish pasties” but you did provide a wonderful introduction to Chaucer, so thank you for that! 🙂 Her big take-away (she is quite a tomboy)was that she too could possibly get to play in the mud like your sister and nieces/nephews got to do..haha. Perhaps we might be so lucky as to have someone who ‘lives close by’ or ‘has worked there too long’ drive us when we visit! Although I can imagine there is SO MUCH MORE to maintaining an estate as yours, the humor and truth that you share with all of us is enjoyed by so many….you really are Living The Dream. Thank you. Dear Lady Carnarvon, what wonderful tales you tell. 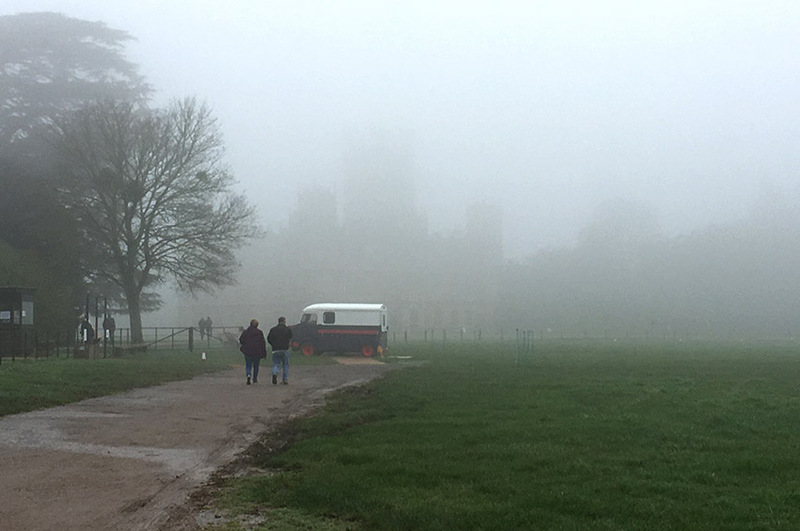 Even through miserable conditions we still want to come to Highclere Castle. Once again, I’m so moved that everyone sees the need to step up and serve your visitors, with smiles on their faces and joy in their hearts…you’ve put together the family-friendly feeling so many places lack. That didn’t just happen. You lead by example and grace…your staff seem to be enjoying the the same experience too. Just think of all the funny stories people will share. I’m going to make a return visit sometime soon…rain or shine. You need to visit !! Having grown up in Missouri I was not only used to definite seasons, but also to the occasional spring time snow and ice storms which came and were gone in the blink of an eye. I have been in southern California for a long while now, and sometimes am wistful for some of that weather. So much sun and usually not much rain here (although sadly, farther north in the state they have been inundated with it, causing mud slides in fire damaged areas). Where I live, the city has no internal water source of its own so must import the water. For quite a while we have been under outdoor water restriction use, and so many have replaced lawns with drought tolerant plants. A sign of the times, but it is amazing how, with a little ingenuity, these new landscapes can also be beautiful. The climate seems to be more uneven, more erratic and of course cities are built where we choose not, where as in the past, it might have been a good site to build them. For our forbears living here there was a good supply of clean water enriches by calcium (limestone), hazels (nuts) for the winter, good trees, varied pasture (shelter) and game. This was one of the best blogs yet! Isn’t it wonderful how bad weather seems to bring out the best and humorous in everyone — well maybe not everyone, but most! I can remember blizzards in New England, growing up, when we were all outside laughing and shoveling like mad! But I think you English do it the best. I can just hear John G’s quips! But I really had to laugh out loud reading the questions from visitors who didn’t know who you were and your answers! Hilarious! We’ve had several freezes lately here in the midsouth! I think my hydrangea has given up the ghost — the new growth that is. I’m counting on her pulling through and giving it another try when the weather warms up! Thank you for sharing your great humor and perseverance and making a good time for your guests, despite the weather. How is York because New York has been the same way – with snow. April showers that bring May flowers has just begun. Thank God Spring comes eventually. You & your husband are such good sports and so accommodating. So nice that you not only work there but live there too! That was cute. The first line is “Living the dream,” and the response is “another day in paradise”! It is a shame that although you can import tea from India, you cannot import sunshine from Las Vegas. We have plenty to go around. I can only offer that April showers bring May flowers as I smile at the pictures of Highclere staff and your lovely family. Where I live (outside Cleveland, Ohio) we are experiencing rain, rain, grey skies and for a bit of variety light snow. We too are “living the dream”. Despite this, there is a bit of warmth in the air. Could Spring be coming? I’ll keep you posted on things on my end of the pond!! I was surprised to hear that some of your visitors did not recognize you or Lord Carnarvon. Before our first visit from California in May 2016, we had seen both of your faces many times on TV, DVDs, and this website. So when Lord Carnarvon walked out to greet us, before guiding us personally around the grounds and gardens, we instantly recognized him. And then as I was the last person to enter the door for your wonderful lecture, I almost bumped into you at the door! I’m embarrassed to say I let out a slight gasp when I looked up to see you walking right toward me. At any rate, your guests not recognizing either of you, and asking what you do and how long you’ve worked there makes for a great story and brought a chuckle out of me. Hope your rain lets up soon. We’re looking forward to our third visit to Highclere on 22 July. I was driving a happy old mud spattered car, practical and goes everywhere..
Great fun to read these details. The castle has found its match. Many thanks. Dear Lady Carnarvon – As always, I enjoyed reading your blog post very much. For some reason when you were describing ferrying your guest around, in my mind’s eye, I could see Branson as the chauffeur in the vintage cars. I could also envision the children being taken into the house through the servants entry while Mrs. Hughes and Mrs. Pattmore clucked over them while they got cleaned up and had gotten some tea and sweets. Your home is so magical in that both the real life stories you tell and the filmed version of Downton seem so embedded in your home and your life’s work, yet you make your home accessible to so many. When I lived in Nebraska, we went by the “old farmer’s tradition” of counting 60 days past a day with fog to having a storm on the 60th day. The worse the fog is, the worse the storm would be. We tracked it for a few years and it was almost always right on target. We also learned that there would be more lambing and calving as the big storms approached due to the drop of the low pressure systems with the storms. Nature, including animals, can gives us humans so much information if we just pause long enough to watch and listen to it. I am sorry you are having so many rainy days. I have lived in the desert now for 9 years and I miss the rain so much that I stop what I am doing and just close my eyes and listen to the rain hitting the windows and the roof when that rare event happens. It has become one of my favorite sounds, along with the winds rustling through the pine trees, a mountain stream bubbling merrily along and a baby’s giggle. I hope you have a beautiful May! Many blessings to you and your staff. April 16 and we still had snow, sleet, and rain here in Massachusetts. The dogs have been wild indoors and pining to play in the fields near our house. Out they went only to be skunked. Taking this as a sign that if Mr. Skunk is out, then real Spring must be arriving soon. I hope so for you! I can appreciate your situation and the damage that could have been done to your beautiful gardens. We in the Hunter Valley in Australia have almost passed through the worse drought on record, and if you have some rain to spare, we would gladly accept it. At present our countryside looks very green but it is deceptive because while we have had some rain, it has not been enough to run off into property dams and the grass that has shot up, has little nutrition. I was fortunate to visit your country in 2015 and fell in love with it. England is like a storybook, incredibly beautiful. My husband and I were there on the 5th of April and were lucky the day was beautiful!!! I was so excited to be there! If that wasn’t enough, when we were in our car to leave setting up our gps, you and your husband walked over to ask if we needed help! In my mind I kept thinking should I ask her? I chickened out, but wish I would have gotten a picture with you! Thank you for your kindness and sharing your beautiful home!! It is certainly nice to know that rain and snow are not confined to England in the spring. Living in Louisville, Kentucky we are just two weeks away from the Kentucky Derby and had an entire day of snow showers with sleet just three days ago. Enjoyed seeing pictures of your soggy grounds as I try to do gardening in mine. At least my camellias did not freeze and are blooming. I saw your beautiful blue Sinnetia (? )plants and are wondering what genus they are. Thank you so very much for giving us all a glimpse into the daily workings of Highclere! Ah! So funny you never told the visitors who were asking if you lived nearby who you are!! I wonder if they will ver know who they met without knowing!! Have faith in Winnie’s wisdom words! After a year of planning, we visited on April 4. And yes, it was in the pouring rain; but that didn’t ‘dampen’ our spirits at all. I never would have guessed that there was so much behind-the-scenes work (and now I realize a small bit of fun and frolic) going on to facilitate our visit. Thanks you all for your hard work. We thoroughly enjoyed our visit and I’m excited to visit again in the future and explore the lovely grounds. I’m happy to have finally seen your beautiful home in person after having seen so often on television. I was struck by how warm and inviting the rooms are, a feeling that doesn’t always translate on-screen. I also enjoyed seeing photos of the family. Again, thank you for opening your home. Then come back another time!!! I apologize for how delayed this response is! I just discovered your blog today when trying to recall the van Dyck painting gracing the wall in Highclere’s dining room. Your writing is a truly delightful! I have had both your Lady Catherine and Lady Almina books for a while now, but unfortunately haven’t read them (too many books, too little time), I must make them a priority now. 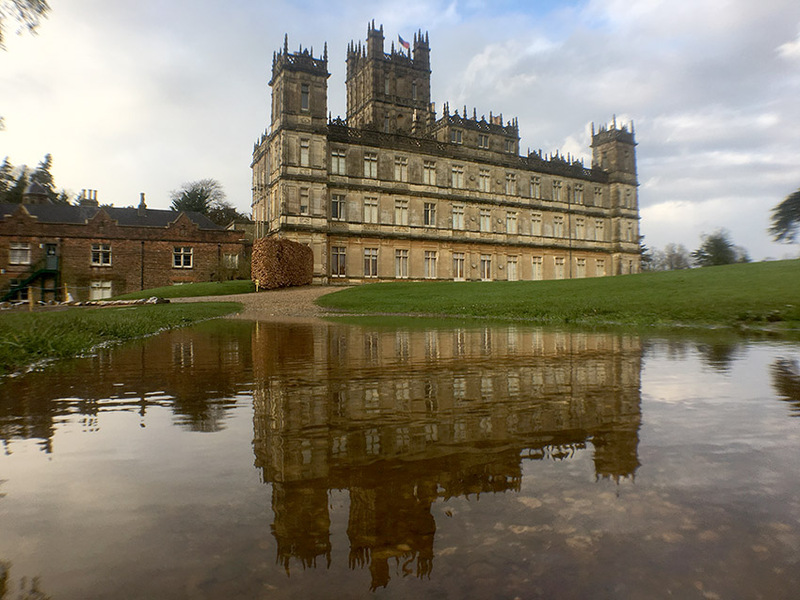 Although the rain inconvenienced you and your team, it is quite amazing how the house is reflected in the pool of water— it reminds me of the black and white picture at the end of the intro to each Downton episode when the melody ends.